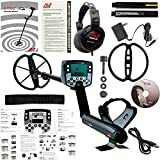 Here is a review of a professional metal detector – MineLab E-Trac. This MD is one of the best on the market, but it is yet not perfect and not everyone can deal with it. Below we’ll discuss its advantages and disadvantages, tell you its story and compare it with another MD – Minelab CTX 3030. If you are the lucky owner of Minelab E-Trac or willing to be the one you are very welcome to write your comments and feedback. Any of your opinions are highly appreciated and important to those who are just planning to buy this device. 5 What do the owners advise? Just like all devices made by the Australian company, E-Trac appeared as a result of improvement of company’s existing models. In 2006 the company introduced Explorer SE and in 2008 Explorer SE Pro appeared on the market – both of them were using FBS technology. At the end of 2008 the company announced a new MD model – E-Trac, designed due to the further improvement of FBS technology. E-Trac is highly efficient, it is using the latest achievements of microelectronics, it has an advanced design, unique menu system, which Explorer MD doesn’t have. The secret of E-Trac is based on two unique technologies, developed by Minelab engineers. These technologies are a multiband frequency one called Full Band Spectrum – FBS and SmartFind – a technology of target evaluation. We also should mention that the company has changed its old ways of MD production and introduced a groundbreaking new process. In the 80s the working frequency was selected first and then a metal detector was designed to use this peculiar frequency. The lower MD working frequency is, the deeper its signal penetrates into the ground; through its sensitivity to small targets with low conductivity, such as bronze, brass and gold will be decreased. When using high working frequencies small targets become easier to find, though high depth values become unreachable. Therefore, Minelab engineers have decided that it’d be a breakthrough on MD market to design a device capable of working with several frequencies simultaneously. So, Sovereign metal detector was introduced in 1990. It was using Broad Band Spectrum technology – BBS (it was sending 17 different frequencies in the range from 1.5 kHz to 25.5 kHz in increments of 1.5 kHz). Increasing the number of the MD working frequencies from 17 to 28 and their higher value from 25.5 kHz to 100 kHz has allowed creating a technology called Full Band Spectrum – FBS. Although low frequencies are efficient for detecting deep-lying targets, they a less sensitive to small targets at the same time. High frequencies are used to detect targets made from bronze, brass, gold and platinum, but the detection depth decreases, especially in highly mineralized ground. FBS technology is Minelab know-how; when using it 28 frequencies are sent, received and analyzed simultaneously. Due to such frequency range Minelab E-Trac metal detector can get more detailed info about the soil structure and composition of any metal target alloy. Can this be even compared to those low-level MD (with one working frequency) and middle level metal detectors (with 2-3 working frequencies, but not simultaneously operating). The second component that ensures E-Trac significant productivity is its technology of target analysis – SmartFind. Smartfind — is a scheme of double discrimination which makes it possible to obtain target conductivity value (СО) and Fe-ratio of the target. At that the information is easily displayed as 2D graphs or just digits. As a result, it is much easier to see between ferrous and non-ferrous metal, even if these targets are lying close together. E-Trac has an excellent discrimination function (it uses the same operating principle as CTX-3030), since it uses two physical properties of the metal to define its type – conductivity and inductivity. These parameters are shown on MD display as a graph and VDI numbers. This ensures precise definition of the metal type as well as working on areas with lots of various rubbish – for example, in a city park or on the beach. To recognize the type of metal E-Trac MD has graphical identification technology SmartFind made as a system of axes one of which is CO (Conductivity-Inductivity) ranging from 1 to 50 and FE axis (Ferrous- Conductivity) from 1 to 35 units. The MD checks both parameters of the located target and displays the obtained info graphically and numerically. Current discrimination system allows the most precise definition of the metal type, because the device checks not only the target conductivity, but its inductivity as well. The display is divided into two parts – black and white. The white area is a target reception area, the black one – discrimination area. Graphical information is supported by numerical one, that is remembered easier and allows more accurate adjustment of the discrimination function. For the first time ever E-Trac MD got the ability to exchange its settings, discrimination masks with other hunters over the Internet by connecting the device to PC via common USB interface. After connecting E-Trac to PC you’ll be able to copy the device discrimination masks onto your computer or vice versa download them from the Internet onto your MD. This function is very convenient considering that the MD can remember only 4 modes created by user. Also it’s much easier to download already written and working software than to waste your time on precise adjustment of all parameters of the device. QuickMask is a simple discrimination mask which is useful, for example, if you need to ignore small metal targets without creating some special complicated discrimination mask on your own. QuickMask is the same as any common metal detector discrimination mask and it can be used as “all metal” mode. Adjustment of vertical FE axis parameter from 1 to 35 allows ignoring any metal targets. Horizontal CE axis adjustment from 1 to 50 allows ignoring non-ferrous metal targets, for example, foil is in the range from 1 to 2. It is a 32-bit microprocessor that has accelerated processing 28 frequency signal and allowed increasing the discrimination scale up to 50х35 units, 1750 segments, this way the discrimination quality got better. As a comparison you may take a look at Explorer SE 3rd model – its discrimination scale is 31х31, 961 segment. E-Trac is supplied with 11-inch Double D coil with a protective case. At that the device has large number of coils from 7 to 14 inches you can buy – made both by Minelab and other manufacturers. The coil is a waterproof one, you can put it under water up to the control unit level. The wire is hidden inside the MD rod, so there are very few chances to damage it somehow while hunting. The rod itself is rather robust, it is extensible and consists of 2 sections. The battery unit for 8 AA batteries is inside the rod as well. There is a headphone output on the elbow board to ensure that its wire won’t hinder the user’s movements. First of all, it is a large one with a backlight, though you can’t see very clear in direct sunlight. The display is divided into two sections – black and white. The white one is for a target receipt and the black one is to ignore signals. Graphical information is supported by numerical one, that is easier to remember and allows adjusting the discriminator more accurately. This device is heavier than those which are usually used by treasure hunters before switching to E-Trac. Not that it weighs significantly more, but by the end of the day your hands get quite tired. However, after about 10 times you go metal detecting with it you’ll get used to this. It’s better to have some spare AA batteries just in case, since you’ll have to replace them rather frequently. So, I’d advise buying a battery unit from the start. Well, it is quite a reasonable price for a metal detector of such level, though it may shock people which aren’t familiar with treasure hunting. You should walk slowly with this detector. After all it was designed in 2008 and processors weren’t as fast then as they are now. At that it must process 28 frequencies. So, the slower you walk, the better the result is. The device really is not easy to deal with, since it has a variety of settings. For the first time, those who aren’t familiar with the MD scale fight the temptation to throw it away into the closest bushes. But they’ll love it later on. All you need is patience and a lot of experience. This metal detector has several embedded pre-set modes for beginners, though still it’s better to use your own settings. We’ll discuss it below. In my opinion, we should compare these metal detectors and it is quite a good idea, since they are from the same product line. I have already done it in my review of Minelab CTX 3030. These devices are alike, but CTX 3030 searches deeper, processes signals faster and locates targets more precisely. It’s really great, but the bad news is that its price is 1000 USD higher, than that of E-Trac. I say: if you can afford CTX 3030 than buy it with no further consideration. But if you can’t then buy a E-Trac. It isn’t that good, but it is much cheaper. I have spent over 200 hours working with this MD and I’m very happy with it, I don’t intend to switch to another one for now. As for the disadvantages – it is not very efficient with its own coil when searching on areas covered with rubbish, however, I’m sure it’s possible to adjust the device to this task. As for the benefits, when walking around the place, where lots of treasure hunters have been before, my result was: a stamp, 20 coins and some buttons. What is still puzzling me is why one and the same set of numbers can sound differently. I dig only where I get clear signals of non-ferrous targets, I don’t use automatic sensitivity mode, because the search depth decreases essentially and the device works efficiently only on areas with lots of rubbish. I always use fast mask and skip unwanted signals one by one for each spot till the device behavior becomes sustainable. You just need to get used to E-Trac. At first, it would drive me crazy and yes, I even wanted to throw it far away. But finally, I thought that it wasn’t about the device, it was about me. I had to find the way to learn how to adjust its settings and use them. So, it was just experience, my friend’s advices and my willingness to try out everything this metal detector can offer as well as both large and small coils to master treasure hunting at any conditions. E-Trac is an excellent device for those who like it slowly (if you know what I mean :)) Guys who are always in a hurry, they as a rule buy Garret MD. Maybe because it seems to them – the faster you run and wave your MD, the more and better targets you find. Actually, the situation is completely the opposite. You must walk slowly and unhurriedly. Yes, the MD is a bit too heavy and it consumes too much power as well. But these are more than outweighed by the device search depth and discrimination function. Its discriminator is one of the best so far – 1750 segments is a magnificent performance. What do the owners advise? If you have never used E-Trac before, before going metal detecting with it we’d recommend trying to use it on some clean lot of the ground. Take a silver coin or a chain, put it into a plastic bag and hide it about 10 inches deep in the ground. Then set the discriminator and try to get a clear signal when the coil comes above the target. Keep in mind that it isn’t recommended to walk fast with E-Trac. The slower the coil moves, the more time the device’s processor has to deal with the incoming signal. This metal detector requires slow coil motions and the strategy of treasure hunting with it is based on complete “sweeping” of the area and not on chaotic headlong running around it. If you want to be ready to any type of metal detecting, then buy small and large coils. By means of the small one (5-8 inches) you can locate targets on dirty ground and when using the large one (15-17 inches) on fields where it is required to scan large areas. Even if it is the first time you are working with a metal detector try not to use any automatic settings. Get used to manual ones, to any sounds, dig various signals and remember how they sound. First it’ll be difficult, but you’ll get used to it and find more treasures. This metal detector isn’t just a toy for 100 USD. However, it won’t do for those who like fast metal detecting as well as for those who don’t like digging into the device to unlock its whole potential. The MD has 28 frequencies, excellent polyphony, discrimination function and lots of settings. It is perfect if you look for silver, since it searches deeper than other devices. It is definitely worth its money, though it’s not as good as the next model. If this article was of any interest or help to you, you are welcome to leave your comments and feedback as well as sharing it with other treasure hunters!